Are you a Walmart supplier? Are you using Retail Link to analyze and optimize your Walmart account? 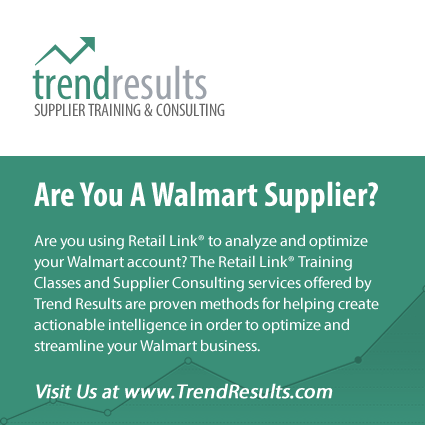 The Retail Link Training Classes and On-Demand Video Training offered by Trend Results are a proven method to help maximize and streamline your Walmart business. All of our Retail Link training courses are full-day programs, conducted in our Retail Link Training Facilities throughout the US and Canada, as well as live webinars. All courses are taught by former Walmart suppliers with many years of experience in the industry. Each class includes 1 hour of follow-up Q&A. Retail Link 101 – The objective of this course is to provide a broad overview of the most common features and applications of Retail Link, including basic report building. This class centers on the fundamentals of Retail Link, allowing the student to gain knowledge of all of the features available within this powerful tool. Retail Link 201 – Build on the skills learned in Retail Link 101. From market basket analysis to community demographics to sales forecasting, this class is perfect for those needing education on the more advanced capabilities of Retail Link. OTIF Fundamentals – It is imperative that suppliers understand this initiative, and fully comprehend the important metrics, scorecards, and resources available to meet the OTIF performance deadlines. This LIVE online webinar will walk you through the fundamentals, best practices, root cause analysis needed to make the most of the new OTIF initiative. Walmart Post Audit & Deduction Recovery – Spend two full days — 9AM to 5PM — with a hands-on trainer and no more than four other supplier representatives. Learn and complete all steps necessary to identify money owed to your company. Participating suppliers will receive two days of hands-on instruction, including accounting fundamentals, OTIF overview and best practices, as well as an entire day of deep dive Q&A. You have better things to do than pour over volumes of sales, supply chain, demographic and forecast data, looking for the valuable insights necessary to maximize your potential as a Walmart supplier. Our analysts have a combined 26 years of experience in retail sales analysis, working with CPG suppliers across all markets and categories. Let us take the burden of sales analysis off of your hands, while providing you with valuable business intelligence that can only come from years of experience working with Walmart and Retail Link.